Sprinting on the treadmill helps to tone the muscles in your buttocks, hips, abdominals, lower back and legs. Besides building muscle, sprinting helps strengthen your cardiovascular system and burns more calories than running at a low to moderate pace for the same period of time. Sprinting intervals also help increase your exercise stamina, so you are able to push yourself harder during non-sprinting workouts. Check with a doctor before starting any new workout routine, especially if you have a prior medical condition or injury. Start your workout by jogging for about 10 minutes at 5.0 mph to warm up your muscles and prepare your body for your sprinting workout. You can also do knee and ankle circles to help loosen up your ligaments and muscles. 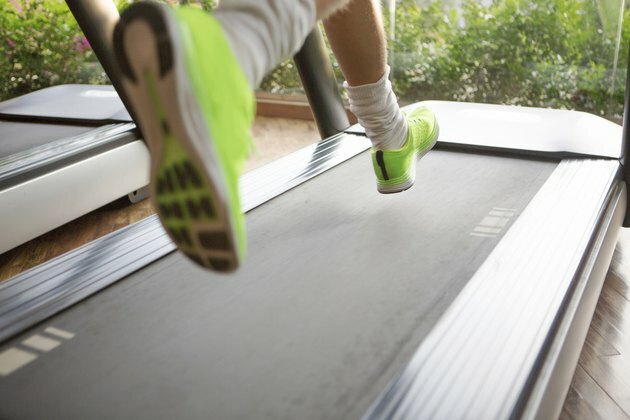 Increase the treadmill speed to 7.5 mph and sprint for 30 seconds. Reduce your speed to 5.0 mph or slower and recover for 90 seconds. Repeat the sprinting and recovery sequence three or more times. For best results, aim for a 30-minute workout three times a week. Because sprinting is an intense exercise, you must give your body 24 hours to rest and recover in between sessions. However, you should still stay active on your non-sprint days. For example, do a light-intensity exercise such as walking or swimming. Vary your sprinting workout to keep your muscles growing and guessing. For example, hop off the treadmill in between sprinting intervals to perform lunges and squats for 90 seconds. You can also run backward or shuffle from side to side on the treadmill at a slow pace in between sprints. To further challenge your lower body and boost the intensity of your workout, alternate the treadmill incline every couple of minutes -- even while sprinting. Always practice proper form when sprinting on a treadmill. Stand tall as you run. Do not lean forward, which utilizes gravity instead of muscle to pull you forward. Point your toes upward as you sprint. Pointing your toes down reduces your stride and limits leg extension. Drive your arms back hard as you sprint to help increase your speed. Your feet tend to follow your arms, so pump them really hard. Start out with just a few short 10- to 15-second sprinting intervals, working your way up to the suggested amount as your strength and stamina improve. Don't skip the recovery period in between sprints, as doing so can lead to injury and pain. Recover for more than 90 seconds if needed, especially if you are new to exercise. Always work at your own pace and fitness level. Stop sprinting if you feel you are pushing yourself too hard or if you experience any kind of pain.